Is your family about to welcome a new dog into your home? If so, congratulations! Getting a new pet is an exciting time, but there are always some nerves. You want to make sure your new family member is happy, healthy, and integrates well with everyone else. And, of course, adding a new dog will impact your schedule and how you organize your day-to-day routine. To make it easier, our Little Rock vet clinic would like to offer some advice based on concerns we often see. 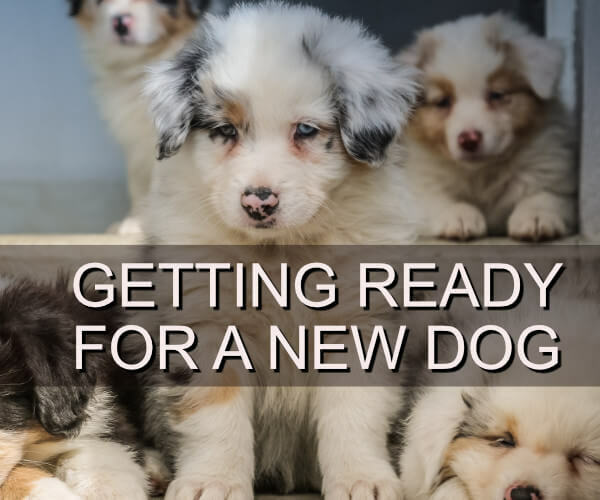 Here’s how to get ready for a new dog! The day your new dog or puppy comes home is not the day you want to be out buying dog food, bowls, toys, and a leash. Instead, have those things ready to go before you pick up your new pet! Dogs need a lot of equipment to be safe, entertained, and happy. You don’t want to be calling a Little Rock vet clinic for care because your pet got away and ended up being injured. Make sure you have a collar, leash, identification tags, bowls, food, and toys before your dog arrives. One word of caution – don’t buy too many toys until you know what your new pet will like. Different animals enjoy different games, and you can spend a lot of money on toys they ignore! Finally, you’ll need to puppy-proof or dog-proof the house. Make sure chemicals, pest traps, choking hazards, and electrical cords are away from your new family member’s curious gaze – and mouth. Whether your dog is a rescue or from a breeder, you want to have a professional veterinary exam within a week of when your dog comes home. Even though shelters and breeders do their best, viruses and diseases can easily spread among dogs. Pets come from a variety of backgrounds, and it pays to have the assurance that their vaccinations are up to date and their health is good. Your Little Rock vet clinic can do a thorough examination. In addition, if the dog is not yet spayed or neutered, schedule that appointment! You don’t want to end up with surprise additions to your family – and there are far too many homeless animals already. Coming into a new home is a huge adjustment, and your pet will need some space and time to adjust. Try to plan the arrival on a weekend where everyone in your family will be home for a few days so your dog can meet everyone and get used to the sights and smells of home. Make sure everyone knows their responsibilities, and take the time to adjust to them. Who is doing the walking, feeding, and playing? It may be harder than those responsible expect, so allow a few days of growing into the new duties. Finally, watch out for jealousy from the new pet and the existing pets and people in the home. Unfortunately, some of the injuries we see at our Little Rock vet clinic are due to fights over territory. It’s important that no one feel neglected, and that existing animals and people get the attention they are used to. As a Little Rock vet clinic, we love helping you welcome a new animal into your home. If you have any questions about food, play, housetraining, or unusual behavior, we’re here to help. Do you have a new family member? Click here to contact us to set up their first exam today!